The second season of Netflix's "House of Cards," starring Kevin Spacey and Robin Wright, is already a big hit with viewers. 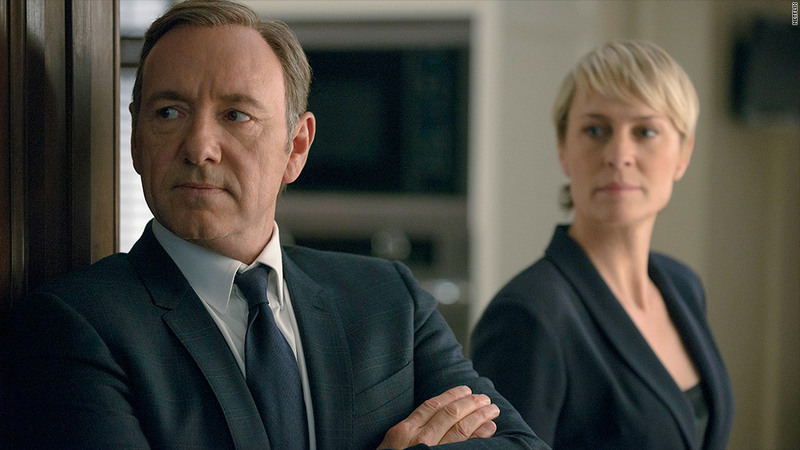 Francis Underwood apparently makes the perfect Valentine's Day date. An impressive 16% of Netflix (NFLX) subscribers of one cable operator streamed at least one episode of the second season of "House of Cards" during a 7-10 hour period on Friday, according to Procera Networks (PKT), which provides Internet traffic management for broadband providers. Procera began monitoring its networks between 8 a.m. and 10 a.m. ET on Friday, a few hours after Netflix released all 13 episodes of the second season of the Washington thriller starring Kevin Spacey and Robin Wright as Francis and Claire Underwood. The firm provided its first snapshot of the streaming data on 5:30 p.m. ET Friday, and has continued to monitor its networks over the weekend. The fact that there was already such a large number of subscribers streaming episodes before the prime viewing hours of the evening shows how strong the pent-up demand was for the show. Procera is expected to release updated viewership figures within the next few days. There was a huge increase in the number of people watching the new season of "House of Cards" compared to last year. Just 2% of Netflix subscribers on a similarly sized cable network streamed at least one episode of the first season of "House of Cards" during its entire premiere weekend in 2013, Procera said. This year's data also shows signs of binge watching. While viewers hadn't made it to the final two episodes of the season by the time the sun was setting on the East Coast, at least some had already watched through the first eleven episodes. And the Emmy-award winning political drama isn't only popular among Americans. Procera's data showed that on a certain Scandinavian network, 6% of Netflix subscribers watched at least one episode of the series on Friday. Netflix was not immediately available for comment. Leading up to Friday's release of the series, Netflix faced some backlash for not making the second season available a day earlier, when much of the East Coast was snowed in. Netflix doesn't release viewership figures for individual programs. Prominent media tracking service Nielsen (NLSN), most well-known for its TV ratings, also does not track audience metrics for Netflix shows. But BTIG analyst Richard Greenfield said it's clear that the company's original programs -- which also includes the highly regarded "Orange is the New Black" -- have helped fuel the company's recent jump in subscribers. It has also kept viewers streaming on Netflix for longer periods of time, he said. Netflix recently announced that it has more than 44 million subscribers worldwide, and they watched more than 2 billion hours of TV shows and movies during the fourth quarter. The growth has helped boost Netflix's stock. Shares have surged 130% during the past year, and are at all-time highs. And there is more good news for Netflix subscribers -- and perhaps investors as well. In the final frames of season two of "House of Cards," Netflix revealed that season two of "Orange is the New Black" will premiere in June. The company has also already announced that production on the third season of "House of Cards" will begin soon.